Going Green…use Vinegar as a rinse aid! I’ve been trying to be more “green” and make a lot of my own cleaners. Some have worked and others have not. This is one that works and is oh so simple! 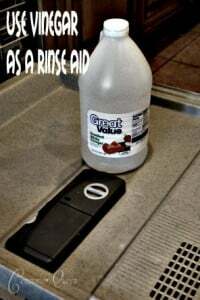 Instead of an expensive rinse aid use vinegar. That’s right plain old vinegar! I know what you’re thinking, the dishes are going to come out smelling like Easter eggs…but I promise that when the cycle is done you can’t smell anything! My dishes came out sparkling! So why not give it a try?! Next time you run out of rinse aid, fill it with vinegar instead. I use vinegar for all kinds of cleaning. A great degreaser and coupled with lemon juice will scrub your kitchen and sink clean. Does anyone know about using vinegar with a septic system? Some things throw the PH off in the septic tank. Would love to know if this is one or not. I am going to try this! Thanks for the great tip! It also works as a chem-free alternative to get ride of lice. I know nobody thinks their child will have them, but from experience working/ volunteering in school nurse office, it’s more likely to get them than not. Dampen hair with a little water, then pour then soak the hair with vinegar. Quickly wrap the hair (be careful not to get in eyes) in cling wrap as tightly as possible. You with literally see the bugs trying to get out. If you do use tweezers to catch them and put in a disposable container. Leave the wrap on for about 15 min, rinse hair and apply with conditioner. Next use a nit comb, divide hair into sections and go through each section to check for nits/bugs. May have to do this a couple of times, but at least it is a safer route than RIDX or other brands. Upside other than getting rid of lice is the hair will be so soft and shiny!